Hendrix Genetics is committed to giving back, not only to the industries in which we do business, but also to the communities in which we work. 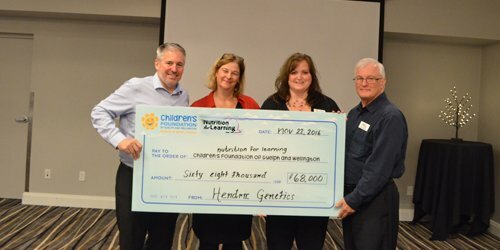 Hendrix Genetics and employees based in Ontario, Canada have pledged donations totaling more than $68,000 to The Children’s Foundation Food & Friends Program and Nutrition for Learning. These local organizations help feed over 40,000 elementary school students in the Ontario, Canada regions where our Canadian facilities are located. Over one hundred and twenty employees chose to donate and many expressed an interest in volunteering their time. This high level of engagement speaks to the value of these organizations as well as our employees’ eagerness to support the health and development of children in our local community.